(Bloomberg) -- The alarming incursion of Arctic air this week betrays a difficult-to-perceive change in how U.S. winters unfold: It’s this cold much less often, which makes the freeze bite much more deeply. In other words, people may forget how frequently the cold used to come. Winter is warming faster than the three other seasons, according to the most recent national climate-science assessment, issued in late 2017. Winters from 1986 to 2016 were 1.5 degree Fahrenheit (0.8 Celsius) warmer than the 1901-1960 average. There are also far fewer cold snaps. Temperature data since 1970 suggest that sudden freezes used to be much more normal, and the U.S. hasn’t had a good, old-fashioned cold streak in more than two decades. 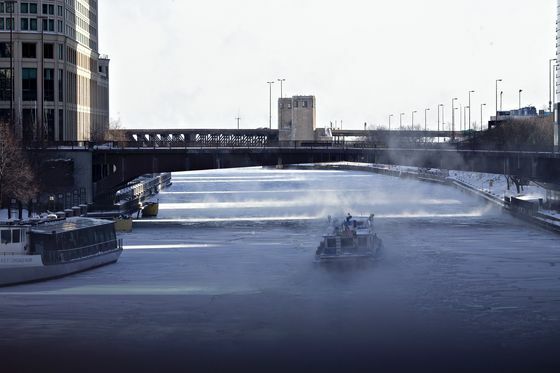 “Nothing really since 1996 has been what I would call a really historic cold air outbreak,” said Ken Kunkel, a researcher at North Carolina State University and the National Oceanic and Atmospheric Administration. “There were some real monsters in the late 1800s,” he added. 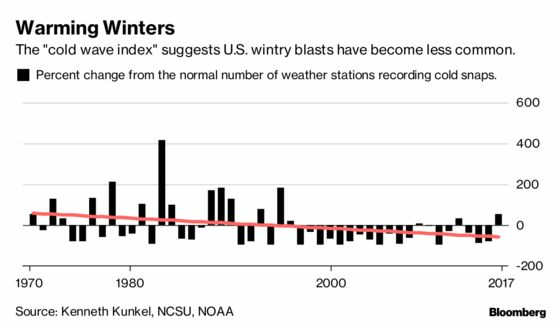 Kunkel for 20 years has kept what he calls a cold wave index, which tracks how often multi-day wintry blasts descend on the U.S. The index measures the number of weather stations recording extreme cold each year as a percentage of a “normal” year, in which 20 percent of the stations have one cold snap. A “cold wave” occurs when temperatures drop below certain thresholds over a set amount of time. That threshold can be either a statistical deviation or an absolute temperature. In either case, each one is geographically dependent. In recent years, waviness in the jet stream has allowed polar air to move southward. Climate scientists are exploring the effect a much-warmer Arctic has to do with such jet stream activity. The temperature numbers alone show less cooling in general — regardless of what’s happening up north, according to Kunkel. The U.S. hit almost twice as many record-low minimum daily temperatures in the last seven days—at 133—as record-high maximum temperatures, according to NOAA data. Over the last 30 days—and also over the last year—it's the other way around, with hot daily records roughly twice as frequent as cold ones.